Expecting a new addition to the family and it won’t have 4 legs and a tail? While you prepare for the arrival of your baby, don’t forget that your dog needs to get ready for the new addition too. Consult an accredited animal behaviourist to help you with any behavioral problems. Any kind of aggression needs to be addressed immediately. Nuisance behaviors like jumping up, jumping onto the couch and barking should also be dealt with. Book your dog in for some obedience classes to teach him basic manners. You will find it much easier to manage your dog when the baby comes along if he can walk nicely on the lead, come when called, lie down on command, stay and sit quietly in the car. Giving your dog a safe haven away from the baby and all the activity of the household will make for a happier dog. The crate can become your dog’s sanctuary as well as a handy place to confine your dog when things get hectic. Dog’s soon come to love their crate. For more info on crate training, click here. Make sure that your dog meets lots of babies before you bring yours home. 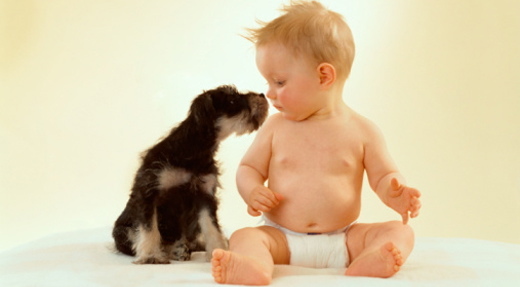 Your dog need to get used to the smells and sounds that go along with babies. Invite friends around who have babies or visit your local park where you are likely to meet Moms and babies. Imagine what life might be like once your baby comes along and introduce your dog to these new routines. Between your dog’s usual walks and play times, have periods when he is not given any attention at all. To do this, either practice down stays or pop him in his crate. Once your hands are full you will not be able to constantly interact with your dog. It is unfair to your dog to lavish loads of attention on him in the weeks before the baby is born and then suddenly to withdraw it.